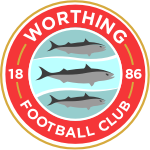 A fairly quiet first-half was followed by a polar opposite second, as both sides contributed to a far more entertaining affair after the break but, it was Worthing who emerged victorious. 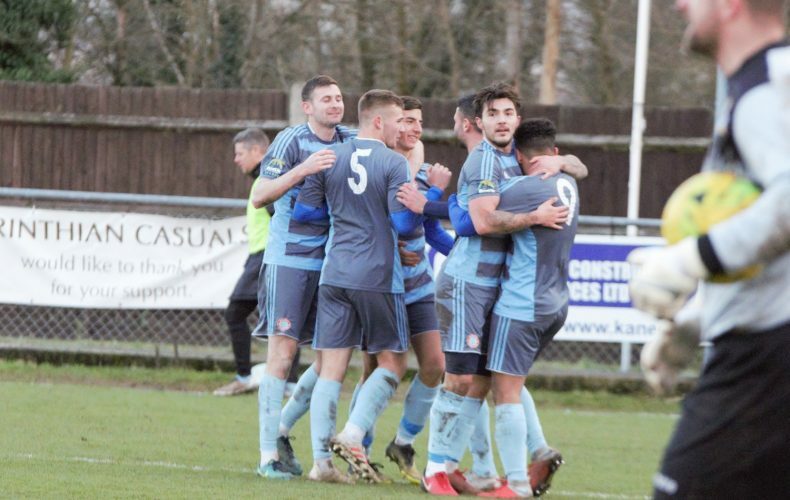 Three changes were in evidence, compared to the side that narrowly lost at form team, Merstham on a decidedly chilly Wednesday night. Billy Barker, Joe Clarke and Callum Kealy stood down for Ollie Pearce, a fit again Jesse Starkey and Lord Lucan, sorry, Ross Edwards. Louie Theophanus wriggled clear of Jalen Jones and James Crane after eleven minutes but it was Josh Huggins who benefitted from Starkey’s poor clearance, although he couldn’t keep his twenty yard shot down. Another stray pass from the returning Starkey lead to Shaun McAuley’s cross skimming over the heads of Theophanus and Joel Colbran, then played back into the six yard box by Dan Darbyshire. Theophanus saw his effort blocked by Jones and the danger evaporated. Kleton Perntreou became the first of the two goalkeepers to be called into action, when he pushed a well-struck drive by the aforementioned Darbyshire over the bar, seconds later. A slip by Edwards allowed new signing, Scott Davies to send Elliott Buchanan away through the middle who, once he’d readjusted onto his right foot, curled an attempt inches wide of KP’s left-hand post. 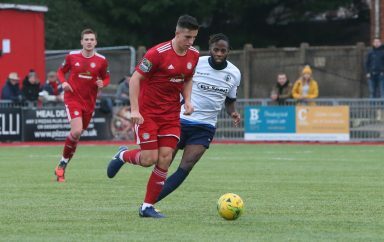 Kingstonian continued to attack the visitor’s goal and McAuley’s fierce shot deflected away off Edwards, after Kleton’s failure to claim a high ball under pressure from Theophanus, lead to Buchanan laying it back to the lurking number eight. The opening period concluded with Ricky Aguiar catching a half-volley nicely but still only giving Rob Tolfrey a comfortable catch. Crane’s header from a loose clearance providing the chance. A passing family of Polar Bears timed their mid-afternoon stroll well, as they were greeted by the sight of a reinvigorated “Reds” taking the lead. Aguiar won possession on halfway and, via a neat one-two with Alex Parsons on the right, drifted inside, where the space opened up for him to bend a beauty around the outstretched hand of Tolfrey. K’s answer to that almost produced an immediate equaliser, when Darbyshire had time and space to give McAuley the opportunity, that he was only denied, by the bolt gun reactions of Perntreou’s right hand. The resulting corner saw KP, this time, keep out a powerful effort by Tommy Brewer, while his teammate, Huggins, was busy appealing for a penalty. Good build-up play down the inside-left channel provided a sight of goal for Edwards but his shot failed to trouble the ‘keeper, until more good work on the same side of the pitch resulted in The Hoops doubling their advantage. Pearce’s delivery was met by Zack Newton, who couldn’t miss a second time, after his initial header had been parried by Tolfrey, straight back out onto his right boot. Jones then showed his strength to hold off Theophanus, with the experienced number ten threatening to be the beneficiary of a midfield mishap, as he charged forward into the box. Where he was denied, moments later, by a sliding Colbran. Buchanan’s ball in, causing brief alarm. Around the midway point of an end-to-end second-half, Pearce provided his team with a three-goal cushion, by guiding home a perfectly-weighted cross from substitute, Billy Barker. Newton having burst clear over the halfway line and released possession to BB, on the left. Ollie tried to return the favour, by putting Newton in the clear but a combination of hesitation and Tolfrey, saw a potential fourth end with Dean Inman getting back to hook the ball out for a throw-in and prevent a corner. A free-kick conceded by Aguiar proved costly, with fifteen minutes to go, as Davies stepped up to curl an unstoppable shot up, over the wall and into the top corner, to give the hosts hope. That hope almost turned into reality when the recently introduced, Manolis Gogonas fired an attempt across the face of goal and narrowly wide. A near identical outcome to fellow sub Sott Day’s fizzer, that only lacked someone on the end of it. A delightful touch by Pearce, gave Starkey the space to race away into opposition territory and slip in Newton, who unleashed an effort from just outside the penalty area but, wide of the target. 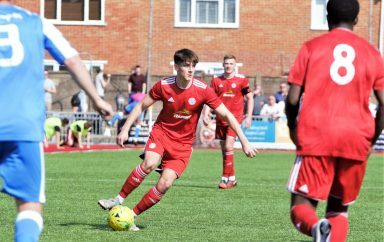 It then fell to Kingstonian to set the away nerves jangling once more, with a header fractionally the wrong side of the upright, despite Day’s best contortionist impression. This coming just after Davies’ low, left-sided, set-piece had bounced up and caught KP in the face and Parsons had conceded the corner. With time running out, Day had better luck with a right wing cross that Inman headed down and the unfortunate Crane gifted a grateful Theophanus, who added insult to injury somewhat, by smashing home off the full-back’s face. Stoppage time saw Davies float the ball over to Buchanan and he fought his way past a grounded Barker but Kleton was on hand to keep the striker at bay. The danger wasn’t over though, as Andy Musungu tried the same delivery, with Buchanan unable to stretch enough at the back stick.